Mangoes are a go-to fruit in my house, not only for the amazing taste, but also for the health benefits. Often called the “King of Fruits”, it’s easy to see how this powerhouse of nutrition is a perfect fruit for yogis on a path of health and well-being. So here are the 5 awesome benefits of mangoes. One of the greatest benefits of mangoes is that they are high in Vitamins A, C & E, as well as, potassium, magnesium, copper and iron. Antioxidants are key to cellular regeneration. Antioxidants aid the body is replenishing after free-radical damage which aids the aging process, the fight against cancer, heart disease, and many other diseases and ailments. Maintaining balance is important to yogis but that balance goes beyond the mat, to our mental health and to our physical health. Mangoes aid the body in creating a proper pH balance due to their alkaline properties. Potassium dense mangoes help protect you from stroke, heart disease, high blood pressure, and high cholesterol. Not only are mangoes high in dietary fiber, they are also high in enzymes that help break down and digest food properly. This creates order in the digestive system and helps keep things flowing smoothly. 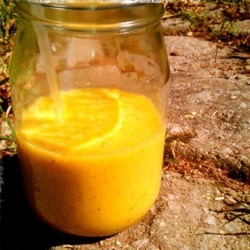 If this has convinced you of the benefits of mangoes, try out this tasty mango smoothie recipe!